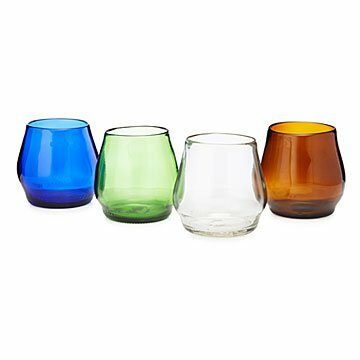 Add elevated industrial style to your barware with Danielle Ruttenberg's glasses made from upcycled bottles. Danielle Ruttenberg's set of handcrafted glasses adds a colorful touch to your barware while embodying the essence of upcycling: Rather than working with reclaimed glass that's crushed, melted, and re-blown into a new form, she takes the bottoms of retired water and wine bottles and transforms them into organically curved cups. Each glass retains the robust color of the original bottle, as well as subtle details of its past life, like the raised mold codes around the base and knurling (bottle speak for that tread-like pattern) on the bottom. This accidental texture feels good in your hand and lends a little grip while you sip. Their elevated industrial style makes a distinctive gift for any wine lover. Handmade in Philadelphia. Glassblowing is an addiction. Danielle Ruttenberg stepped into a glass studio for the first time during her studies at Tyler School of Art. The heat was enticing and the molten glass had her hooked. She went into business after receiving her BFA. Through years of designing and fabricating, she began to recognize the excess of waste and high energy use that comes from the glass making process. It was then that she teamed up with Rebecca Davies and Mark Ellis to introduce a line of glassware made exclusively from discarded bottles. Their mission, through the creation of hand-blown, small-batch home accessories made from bottle glass is to build a more sustainable art form and manufacturing practice.